*HOLIDAY SHIPPING* - Please note, orders placed now are NOT guaranteed to arrive before the holiday. We will do our best to process and send your order as quickly as possible. Please refer to our shipping map and estimated ship times to get a better idea on delivery times. - Also, Due to the high volume of orders, we are not offering express or overnight shipping options. Thank you for understanding. Have a great holiday. Please read our standard shipping policy below for details on when you can expect you order to arrive. Add 2 to 3 business days to process your order and get it out of our warehouse. Then add the transit time of the "ship to" location from the graphic below. This calculation should give you a good idea for a delivery date. all dates are based upon regular business days (Mon-Fri) not including weekends or holidays. Please note: * a business day does not include Saturdays, Sundays, or holidays. Remember, this is designed to be a guide to estimate shipping for an item. You may have other things like item size, weather, or other things that affect the delivery time. 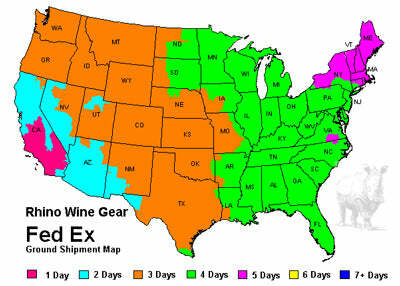 Rhino Wine Gear offers fast reliable shipping with FedEx, UPS, and USPS. Most Items will ship by FedEx or UPS Ground delivery. Wine Art usually ships by USPS. Most orders ship within 2-3 business days from when the order was placed. No, we do not ship to a P.O. Box. Most orders are shipped by UPS or FedEx. These carriers do not offer that option. Shipping charges are based variety of factors. These may be weight, size, distance, or price. I ordered a few items, why is my items being shipped separately? We have a few different suppliers and warehouses around the country. Not every location has all of our products. This could also occur if a product is temporarily out of stock. You will be notified if it will take a long time to get restocked. Yes. We do. Simply enter your shipping address during check out to see shipping costs. Please note, there may be certain restrictions on the dimension and weight of packages that we can ship to these states. Please use a freight forwarder like Bongo International Parcel and Mail Forwarding to service our international customers. Bongo International, and similar services, provides it's customers with their very own US address (not a P.O. Box). Once you have a US address, you will be able to make purchases with us as well as other US based online retailers. We use fast and reliable shipping by FedEx, UPS or USPS. We may use other carriers as necessary depending on your order's size and weight. Most products are guaranteed to leave our warehouse within 1-3 business days. However, certain large items and products that cannot be shipped by FedEx or UPS are not guaranteed to ship within these parameters. Your order might also be delayed due to account verification problems - we can usually resolve any such problems within two additional business days.How do I track my order? Once your order is shipped, an e-mail will be sent to you with the order tracking number and carrier service. If we re-ship a product in these cases, there will be no second shipping charge. If you have any questions you can contact us anytime at info [at] rhinowinegear [dot] com. Thank you for visiting Rhino Wine Gear!